Goldstone Infratech Limited (GIL) is a part of the highly diversified Goldstone Group, with major interests in Composite Insulators, Amorphous core-distribution transformers, Data Analysis and IT Consulting. GIL is the largest manufacturer and supplier of Composite Insulators in India. The combined order will increase the topline by about 60 crores. Due to the tie up with BYD, the company holds an added advantage. For example :- Batteries form approximately 60% of the total cost of these Electric Buses. 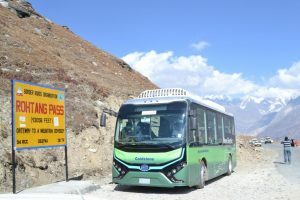 Ashok Leyland imported batteries from USA whereas Goldstone`s trial bus was fitted with one from none other than BYD itself who are the market leaders in Battery segment and originally belong to this segment only. Definitely this 60% cost component would be much lower for these people compared to USA batteries. Battery cost can well be said as raw material for the Electric Buses and BYD / Goldstone have a huge advantage on this count. The company has an early mover advantage. With the receipt of orders from the government, they will have an upper hand in other state governments too. It is also worth mentioning that going forward they will have to undertake the maintenance of these buses which will help them increase margins and thus increase their bottom line. Goldstone Infra had two triggers to watch. First the open offer story and academics say the open offer price should be 43/- (Of course, now that the current price is way higher than that price, it just acts as an insurance). The second trigger was about the Electric buses story which is gathering momentum and it might go up significantly. They also tried to sell the insulator business to a US based company Maclean Power Systems. http://corporates.bseindia.com/xml-data/corpfiling/AttachHis/DBA04988_7B6B_401C_82E4_E4DABAA62294_080853.pdf valued at 108 crores . But this information was not known to Retail Shareholders and public domain until February 13, 2016. Since the promoters and minority shareholders were at loggerheads in view of a dispute pending over “Open Offer” Price the resolution was defeated as it was a Special Resolution. And now it is proving to be a boon to minority shareholders. Now even if the “Open Offer” were to be made @ Rs. 43, no shares would be tendered in view of market price ruling much higher and improved business prospects. And Promoters if they want to increase their holding from 51% will have to come out with much higher offer. Alternatively, BYD Auto may also pick up holding in the Company which again will be at a higher price. Overall a very safe bet with early signs of multibagger opportunity. Below are some the key developments that have taken place or have come to my knowledge recently. These developments may or may not be related directly to the Goldstone Stock as such but important from a sector point of view. So sharing them below. I would suggest all the stakeholders to go through it and understand the potential of the overall sector. Goldstone seems to get an early mover advantage. Price has already shown the true potential. Inspite being in T group the stock has show good upmove which shows that the strength is real and not speculative in nature. Disclosure: I personally hold the stock so my views may be biased. Disclaimer: I, am not registered under SEBI (Research Analysts) Regulations, 2014. No content on this blog should be construed to be investment advice. Any security specific discussion on this site is not a recommendation to Buy / Hold / Sell. The purpose of this site is solely for investor education. You should consult a qualified financial advisor prior to making any actual investment or trading decisions. Electrical buses are the way to go. I travelled in china and particularly had the chance travel in byd electrical car. Its a solid car. Also, China is replacing city buses with electrical buses. Market is big. My only question is, BYD is too big a vompany for Goldstone to chew. BYD may not show big interest to goahead with them. They may easily find better partners since they are much much big.. most of the mobile batteriea are manufactured by them. I read somewhere that they hold 90% market share.. so…. would like to connect qith you to further deliberate on this. Thanks for your message. If you read the article on telanganatoday you will understand that they are trying to setup a manufacturing unit In India. With the help of Goldstone they are scouting for land and once they see the growth coming in they will start manufacturing in India itself. I dont see a reason why they would partner with someone else. Also partnering with a small company has its own advantage. Going forward it is also possible that they acquire Goldstone Infratech. But we need to go slowly and keep watching events as and when they happen. Can I buy at cmp? How can I receive blog updates via email? Any subscribe button? Would not recommend to buy or sell. I have shared the facts. If you feel its worth buying you may buy. Note that it has moved up a lot in the recent past. Thanks for your suggestion will add an option to subscribe. Till then keep visiting on weekly basis. I am not in a business of recommendation. I have shared the facts. If you find it good you may buy. Note that the stock has already moved up a lot. Good research, I think it is really a multibaggar. Thanks. Lets see. Hopefully it will work well. Thanks for sharing this comprehensive details. I was trying to find out the exact details of the terms and conditions of tie up between Goldstone and BYD. Unfortunately, there are no details in Annual Report of 2016, website of goldstone or that of BYD. The purpose of knowing this was to know the details of the value addition that will be coming in the books of Goldstone and the long term sustainability of the tie up between Goldstone and BYD. Please share details / documents if you find any. Thanks again for sharing. Please let me know what you make of this! Thanks. The deal has just happened so there are no available docs currently. I feel that the fact that they have received an order shows that the tie-up is real. Focus more on the story that is going to get developed. Just think 2 orders of 25 and 6 has taken the stock to these levels. Just think if they get order of 100 more from BEST and 150 from Bangalore + others where this will end. I know that there are concerns on the profit margins and other things but thats not the focus area as everything will be in place. Receipt of orders is more important and till it keeps receiving orders I dont have any issues. you are right. That message was for my friends who just bought the stock on my recommendation for the open offer which was expected to be at Rs.43. Since they are not into markets regularly and just followed my advice I asked them to exit slowly as the purpose was solved. Even I took out my capital and now holding it FOC but will keep on riding. Still holding some good qty. Thank you. Your reply is very transparent and honest. . This is the market where no one can predict. We can analyse an outcome. Do not know who is wiser. Buyer or Seller? So your action is right. Is there any link between Goldstone Infratech with Goldstone Technologies? There is no link in relation to business. Promoters same. Group same. Your analysis is fine. BYD is very reputable but Goldstone is not. It is led by fugitive criminal, P.S.Prasad who has an interpol red corner notice to his name. He has been wanted by the US Department of Justice for over 20 years but extradition attempts have failed as he has connections in Delhi in both parties (Congress and BJP). More importantly, Prasad has also cheated Cyrus Mistry and numerous Paigah families in the Hyderabad area by falsifying real estate pathas and selling them to builders of flats. Thanks for your reply. I haven’t verified the information but will surely do it. I want to know that as company is doing business of insulators and silicon etc..and as per company they have got an order of electric buses…but the same is not showing on their website that they got the order or the plant is under process?? are you having advisory service for stocks or you have only blog. I would like to see more your recommendation/ analysis of upcoming companies like goldstone, how to get it. I do not run an advisory. Nor this is a recommendation. I am just sharing the facts so that everyone knows about the stock. I may be completely wrong with my analysis. But I put money where my mouth is. Yes the company is into insulator business. This is a new venture which they have starts with BYD. You can check the details on the bse website. They have got couple of orders already which they have notified to the stock exchange. Hi Dhaval, do you have any update on this stock. It is hitting continues LC. Its hitting LC as there is some news about promoters involved in land scam. But you may see the clarification given to the stock exchanges http://corporates.bseindia.com/xml-data/corpfiling/AttachHis/9e295cca-c673-45a5-a7c1-e41d86823f4d.pdf it clearly mentions that they are not the promoters of goldstone infratech and the news has no effect on the company. But this has resulted into a sentimental effect on the counter and hence the LC. We need to wait and watch further developments. Till the BYD deal is on there is nothing much to worry IMHO. Now that the LC’s have stopped, do you think it is a worthy buy at the current level? 2) Talking specifically about goldstone I have said multiple times that I am holding it FOC and I will continue to hold till the BYD Deal is intact. You need to take that call. Like I have mentioned in the past. I am holding it Free of cost and will continue to hold till the story is intact.